Just about any headset you can use with a phone or tablet can be used with Nintendo’s Switch app to chat with friends during rounds of Splatoon 2. You don’t have to pick up Hori’s official licensed headset, but there are a couple of reasons you might want to. First off, just look at the thing. The tentacle microphone? The Forge-branded ear panels? That strange little connector dealio in the shape of a squid? Put this on your head and you’re just a mask and a quick trip to the seafood counter at your local market away from being an actual squid kid. Speaking of that odd connector, it’s one of the main reasons to score one of these sets instead of just using whatever headset you have lying around. The cable at the top of the squid connector goes to the headset. The bottom right wire plugs into your cell phone or tablet to facilitate chat via the Switch app. And the cable coming off the bottom left plugs into the Switch itself, delivering audio from the console to the headset. That’s the kicker, right there. 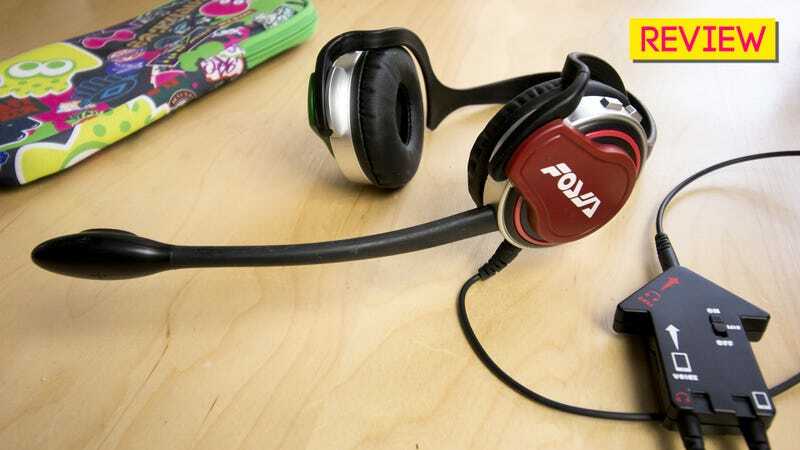 A headset plugged into just your phone only gives you chat audio, and the ear cups will muffle the sound of the game. With the Splat & Chat, you get both, with dual volume controls for balancing voice with game audio. The package comes with both red and green covers, so you can change with your team, probably. Is it an elegant solution? Nah. You’ve got three wires to contend with, plus an included extension cable should you want to play the game with the Switch in TV mode. It’s not exactly a high-quality audio device, either. It’s a $30 headset, and it sounds like a $30 headset. The sound isn’t especially rich or deep, and I’ve been told I sound a little bit tinny when talking on the mic. But hey, it gets the job done, and it gets the job done cheap. Plus, it makes you look so good. Note the slightly bended ears in the picture there. I have a very large head, and the Splat & Chat does not feature an adjustable headband, For normal-sized head people, the natural curve of the skull aids in getting the headset to fit right. Those with larger craniums might have issues. Measure your head, people. Along with the official headset, Hori sent along a couple of other Splatoon 2 accessories for the Switch, because Hori can’t help itself. Every time I request a review unit, they send a dozen different things, just in case. Stuff like the Splatoon 2 Hard Pouch ($19.99). Or the Splatoon 2 Splat Pack, which comes with a soft case, a squid-shaped cartridge pouch and a pair of analog stick nubs. Both fine-looking products. Fine-looking products that do not have room for the Splat & Chat headset, I might add. I guess we’re just supposed to leave it on our heads. Hori’s Splatoon 2 Splat & Chat Headset and its pouchy companions should be available wherever video game accessories are sold, unless they’ve all sold out. Look for our full review of Splatoon 2: The Video Game early next week.